Josie Rapp with Erlanger Mayor, Tyson Hermes. PHOTO: The River City News. Living 100 years is rare and it deserves to be celebrated in a special way. On April 16th there will be a large gathering of family and friends to mark this milestone of one century on this earth. Josephine Ann Rapp, the youngest daughter of four children, was born on April, 19, 1916 into a loving family of Lebanese immigrants that realized the importance of hard work. Her parents owned a pool hall in downtown Cincinnati at 4th & Sycamore. Growing up, she loved school, but began working at an early age. Always a positive person with an upbeat outlook on life, her resilient nature has carried her through many struggles, such as the terrible loss of her Brother and Mother, before her first birthday. She would grow to become very close with her mother-in-law, Margret “Maggie” Rapp, who lived to the ripe old age of 105 years old. Married to Charles C. Rapp, at Sacred Heart Church in Bellevue, Kentucky on June 22 of 1940, they were blessed with 10 children and raised the family in Bellevue for over 40 years. They celebrated 62 years of marriage before his passing on May 4, 2002. As the matriarch of the Rapp family, her true passion has been her children. She never misses a birthday for her 28 grandchildren, 45 great grandchildren and 5 great-great grandchildren. Grandma is a treasure that graces our lives with her beauty, wit and wisdom. With a heart of gold, her generosity is legendary. A life-long learner, accomplished cook, superior seamstress and a master creator of crafts, she is a successful fundraiser and philanthropist. Endless energy and compassion have filled a life devoted to God, family and charity. The last 34 years “Jo” has been a leading member at St Barbara’s Catholic Church in Erlanger, KY where she has played an instrumental part of the incredible growth at her parish. She is also a member of the Red Hats, the Crafty Ladies, Beechgrove Homemakers, St. Barb’s Senior’s and the Bereavement Committee. She has cooked countless meals for the priests of the Diocese of Covington and served 28 years as a Eucharistic minister. To this day, she keeps a very busy schedule. For someone that has never driven an automobile, she has never had any problem getting around. Her favorite bible verse, which she has engraved on a stone at St. Barbara’s, is Corinthians 13:13: “And now these three remain: faith, hope and love. But the greatest of these is love.” Her strong “faith” in God has guided her every step of her life. She spreads “hope” to every person she has ever touched and never misses an opportunity to help others. A beautiful soul, that loves life with every breath and shares that “love” with all of her family and friends. We are blessed to share a part of her life. Her own warm smile and tender touch will remind you that God is present and working through Jo Rapp for the last 100 years! 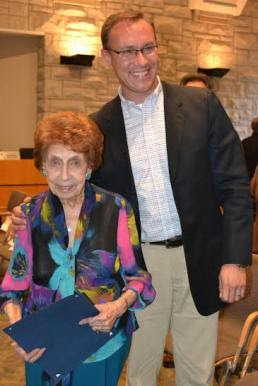 Photo: Josie Rapp was honored by Erlanger City Council. April 19 was officially named in her honor. Rapp will turn 100 years old that day. Photo: River City News.